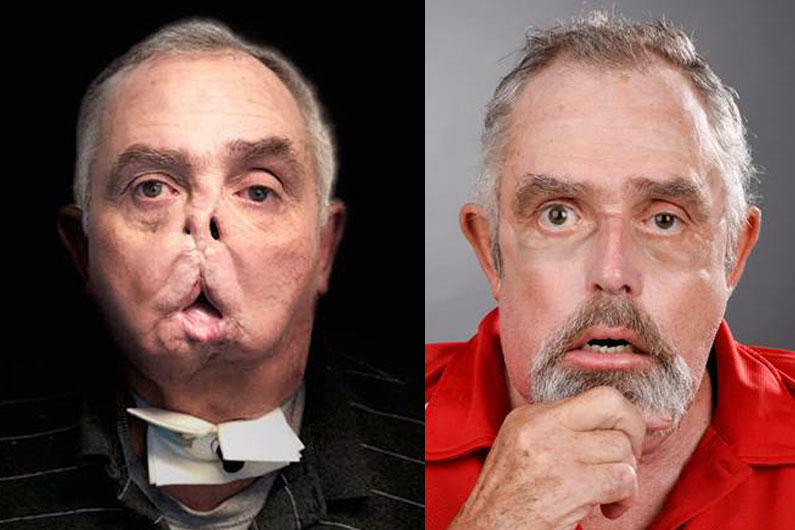 A 64-year-old man in Canada who was left disfigured after a hunting accident has become the oldest person in the world to receive a face transplant, his doctors report. Four months after the surgery, performed at Hospital Maisonneuve-Rosemont in Montreal, the man has regained the ability to breathe properly and has begun to chew, smell, and speak with his new face, according to a press release issued by the University of Montreal. Seven years ago, the man was severely disfigured by an accidental gunshot. He lived in constant, excruciating pain and underwent five reconstructive surgeries. Social interactions and public appearances became difficult, and the man, a natural extrovert, chose to remain indoors and isolated, the hospital said. It soon became clear that the only option was a was face transplant to restore his jaws, facial muscles and nerves, teeth, lips and nose. "As a plastic surgeon, I know that, no matter large or small, injuries to the face have a particularly symbolic aspect and are closely linked to our identity," the man's plastic surgeon, Dr. Daniel Borsuk, said in a statement. "Facial disfigurement can have a detrimental effect on self-confidence and productivity, and therefore, this transplant offered immense hope and possibility to our patient." The 30-hour operation took place four months ago and involved more than 100 specialists and health professionals, including doctors, nurses, and many other personnel. The transplant was made possible with an organ donation coordinated by Transplant Québec, with the permission of the donor's family. "This delicate operation is the result of years of concerted, meticulous work by an incredible team and the incredible bravery and cooperation of the patient and his family," Borsuk said. "Through the combination of science, technology, engineering and art we attempted to build on the knowledge and experience of the pioneers in the field to perform the best facial transplant possible for our patient." The procedure was the first successful face transplant in Canada. The world's first face transplant was performed in France in 2005. The recipient, Isabelle Diniore died last year at the age of 49, 11 years after the surgery. Last month, it was reported that 21-year-old Katie Stubblefield became the youngest ever recipient of a face transplant after surviving a suicide attempt at the age of 18.